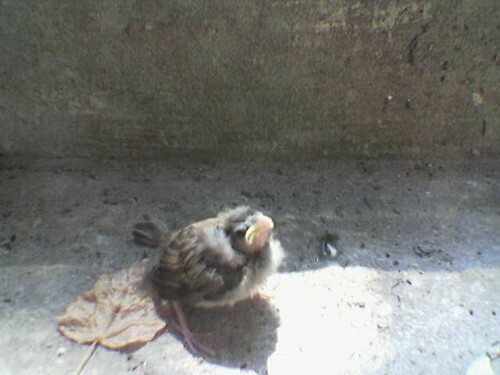 This sparrow chick was sitting on the steps outside the office today. He (She?) 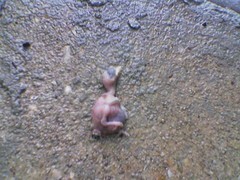 probably came from the same nest from which those other dead birds fell. 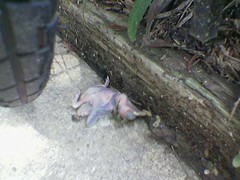 This one was still alive, though, and rather scared and disoriented. I was able to coax him onto my hand, and he showed himself well on his way to full adult birdhood when he jumped off and shakily glided back down to the ground, wings flapping frantically. I picked him up again and left him in the bushes by the door, where I hope he’ll be able to find worms and grubs to eat — and not be eaten by them in turn. Update: Well, I returned to the office today, and there on the steps: dead chick. I guess he just wasn’t ready for the grand adventure of life. The carcass is now in the trash, off to join its siblings. Looks like it might have been an English House Sparrow, in which case it’s untimely demise is a good thing. English House Sparrows are an invasive species that take over the habit of native birds. They are a prime factor in the decline of the Eastern Bluebird, among others.